Radiologists really don't want to go into a patient's EHR looking for information to aid their reporting. What they want is that the desirable information from the EHR be available in their image viewer as they're interpreting an exam. The often-discussed image-enabled EHR is essentially a tool for the referring clinician. 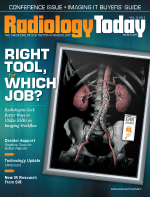 What radiologists really need is an EHR-enabled viewer. David Yeager writes on this topic in this month's issue. "The issue is how efficiently they can extract that clinical history and move on with their interpretation. What you will probably see is more and more focus on information displays … without the radiologist having to go into the patient's record and search for data in different locations," says Kevin W. McEnery, MD, in Yeager's article. McEnery is a professor of radiology and the director of innovation in imaging informatics at the University of Texas M.D. Anderson Cancer Center. PACS images have been around for 20 years and EHRs have their own separate history. Health care IT has entered the age of enterprise imaging solutions. In most health care organizations, EHRs have become the IT project in vogue, garnering dollars and pushing many others to the margins. Those former data silos do need to come together because physicians need both simultaneously. But as the experts Yeager spoke with point out, PACS and EHR information shouldn't meet on some created neutral ground. Radiologists want their EHR data brought onto their reading room turf so they can utilize them in their normal course of doing their work—the same reason clinicians want their patients' images readily visible in their EHRs. Also in this issue, Beth Orenstein writes about another aspect of bringing useful information to the point of care. Her profile of the joint project of the ACR, Nuance Communications, and Massachusetts General Hospital (MGH), now in beta there, suggests evidence-based treatment guidelines for their radiology reports based on their findings in those reports. "It recognizes the situation the radiologist is in and is able to produce real, useful standard guidelines for the patient's record," Tarik Alkasab, MD, PhD, a radiologist at MGH involved with the program, told Orenstein.